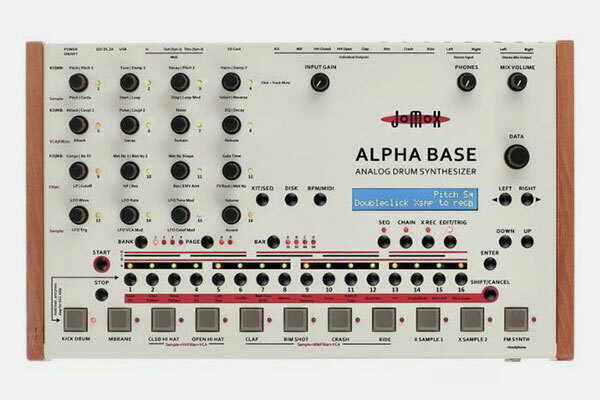 The Alpha Base is the new drum flagship of Jomox. It's true analogue. Eleven instruments, sequencer, Midi/USB/SD-Card. Samples. Sampling inputs, balanced individual outputs. Although it may appear similar to the classics XBASE 09, 999 and 888, the ALPHA BASE has an entirely new design under the hood. We have put in the concentrated know-how of the Jomox drum machines and of our synths of the past 20 years. We have simplified some things, but also added new components or have combined them new. The outcome is the best sounding and most versatile drum machine that Jomox has ever built.